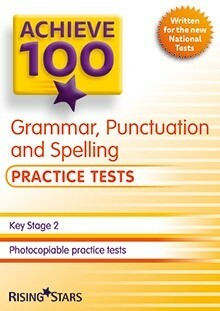 Use Achieve 100 Grammar, Punctuation and Spelling Practice Tests during the summer term in the lead up to the National Tests to ensure children become confident answering test-style questions. Containing three sets of photocopiable practice test papers written and structured in the style of the National Tests to help build children's confidence in sitting National Test-style papers. All answers, mark schemes and spelling test transcripts are provided to allow teachers to identify children's strengths and weaknesses to direct further revision. This product will be published in October 2015 and will include Photocopiable Test Pack with permanent online access to downloadable versions of each test paper via My Rising Stars. This test pack contains three tests, each with two papers and both papers are written in the style of the new National Tests. Each test is roughly two thirds of the length of the National Test to enable teachers to fit them more easily in to the school day or the booster class. The Achieve Practice Tests are not timed they are to be used at the teachers discretion in class to get children used to the format of the questions in the National Tests. These are not mock examinations.